I bought a small form factor pc recently to serve as HTPC (home theater pc, or pc wot plays media files) and allround home, web and cloud server. It has integrated graphics. It runs linux. It is in other words not a gaming pc. But I still went ahead and bought a controller with it, installed Steam and picked up a number of indie titles to run on it. It has turned out surprisingly well. Due in large part to the fact that it has allowed me to reconnect with Double Fine’s 2006 cult classic Psychonauts. 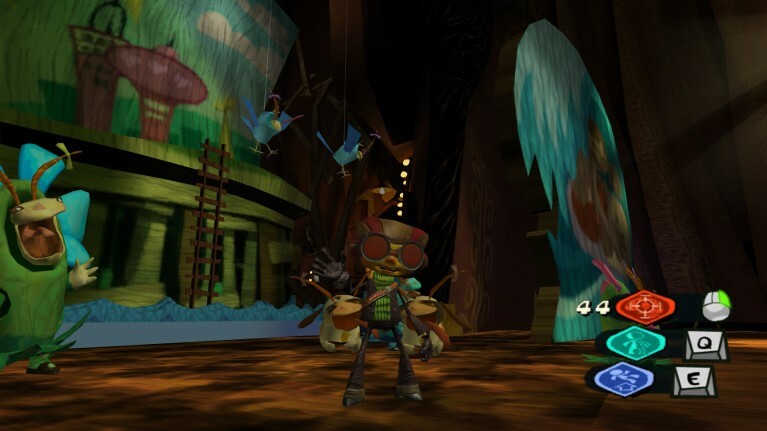 I liked Psychonauts before when I rushed through every level to get to the endgame. Now that I have played it at a more leisurely pace, I think that it might just be the best game that I have ever played in terms of world, environment and characters. The reasoning is fairly simple. You may have heard people talk of games where the fate of the characters mattered to them, beyond merely tactical concerns. Maybe you have felt that way yourself. Me, not so much. Except, that is, for the summer camp of Whispering Rock that is the setting of Psychonauts and the collection of misfits that inhabit it.